Odisha has received investment proposals worth Rs 466 crore for the setting up of processing units at Seafood Park at Deras near Bhubaneswar. The park will process 90,860 tpa of seafood and is expected to generate 7,214 jobs. 20 companies that have already committed investments for setting up units at the seafood park are Falcon Marine Exports, Magnum Seafoods, Utkal Exports and Vizag-based Coastal Corporation. Falcon Marine Exports will set up the largest seafood processing unit with a capacity of 37,000 tonnes per annum (tpa) of seafood and provide employment opportunities for 4,060. Spread over 152 acres of land, the project has been approved under the Mega Food park scheme of the Union ministry of food processing industries and will comprise of 41 processing units, Chopra said. The project will provide plug and play infrastructure and access to common facilities like devices for cold storage, pre-processing and post-processing facilities, ice plant, packaging, polythene unit and a research and development facility. According to the norms of the state government, a financial assistance of up to 20 per cent of the project cost (excluding cost of the land) subject to limit of Rs 15 crore will be provided to special purpose vehicle (SPV) which will promote sea foodpark. The subsidy can also be provided in the form of equity participation through IDCO or Odisha Small Industries Corporation Ltd (OSIC). Odisha’s coastline of 480 km is rich in seafood resources and the state government is keen to utilize the full potential of the sector. According to the Fishery Survey in India, the fisheries potential of Odisha is 513,667 million tonnes per annum (MTPA). Odisha’s proximity to South-East Asian markets and increasing demand in Japan and Europe will further aid the development of sea food sector in the state, Chopra said. With the increasing global demand for seafood, India has already become the 11th largest exporter of seafood in the world. 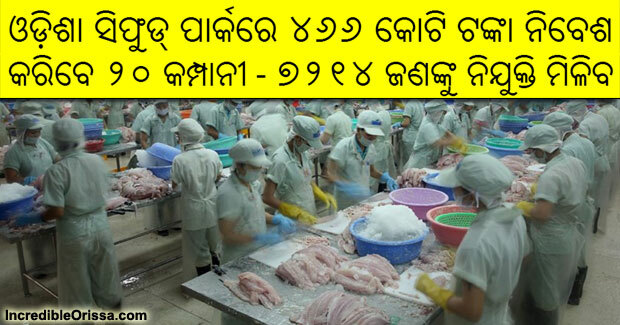 The Odisha government has set up a target of reaching Rs 20,000 crore seafood exports annually in the next five years from the present level of Rs 2,500 crore.